It's frustrating and frightening to have a wage garnishment in place on your paycheck. You go to work every day, but because of your outstanding debts someone sued you, got a judgment, and now they're garnishing your wages. Once your creditors have sued you, they can then get an order for wage garnishment, which takes money directly from your paycheck. Ventura Bankruptcy & Wage Garnishment Attorney Eric Ridley is dedicated to helping you stop a wage garnishment in Ventura California and keep the money you have earned! Your creditors have several choices when pursuing unpaid debts. They can obtain a court order known as a wage garnishment which requires that your employer withhold a specified amount from your paycheck and give that money directly to the creditor. Typically, a wage garnishment in Ventura is capped at 25% of your disposable earnings (your take-home pay once all deductions and other withholdings are made). A common myth in bankruptcy is that wage garnishment is limited to 25%, but in some cases, the court can allow for 50% of your weekly wages or more to be garnished on behalf of your creditors. You can prevent wage garnishment before it happens. If a creditor has filed a lawsuit against you for unpaid debts, you will be notified. When you receive that notice, you should immediately speak with a bankruptcy attorney in Ventura CA who can explain the ways in which you can protect your rights, your money, your bank account, and your paycheck by filing for bankruptcy. I'm a Ventura bankruptcy attorney, and I can help you determine whether filing for bankruptcy is your best option to stop wage garnishment in Ventura. Filing for bankruptcy immediately created an "automatic stay," which is a federal injunction which stops all forms of wage garnishment and allows you to collect your regular wages during the bankruptcy proceeding. If your underlying debts are dischargeable in Chapter 7 bankruptcy, the debt can be eliminated completely. This means the wage garnishment is also eliminated and will be gone forever. If a creditor has filed a lawsuit against you for wage garnishment, you have the ability to take action to stop the wage garnishment. 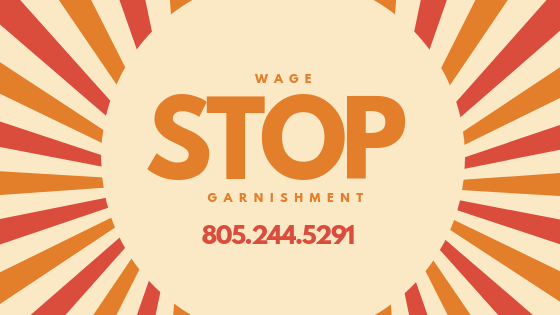 The California Chapter 7 lawyer at the Law Offices of Eric Ridley can stop wage garnishment before it even starts. For a free, friendly, in-depth bankruptcy or wage garnishment consultation, call me right now at 805-244-5291.